Left: Tinted Venus by John Gibson, 1790-1866. [Click upon images at left for a larger photographs and additional information.]. 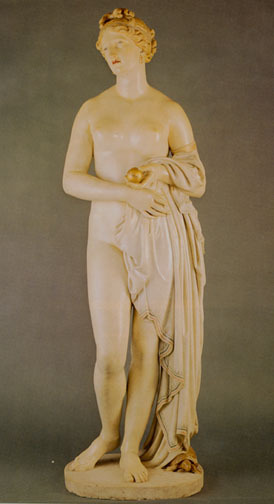 One of the sculptural sensations of the International Exhibition of 1862 in London was undoubtedly John Gibson's Tinted Venus, displayed with other tinted status by Gibson in a specially designed Greek temple by Owen Jones "simple, chaste, in consonance with the statuary and to set them off." The Venus in fact was one of at least five versions of at least two different scales of the same subject. It had been finished six years earlier, but for four of these Gibson had refused to part with the work, much to the understandable annoyance of Mr and Mrs Preston who had commissioned it. It had become the most carefully laboured work the artist had ever executed, on which he had wrought the forms up to the highest standard of the ideal. To quote (rather than paraphrase) the artist: "The expression I endeavoured to give my Venus was that spiritual elevations of character which results from purity and sweetness, combined with an air of unaffected dignity and grace. . . . " He then proceeded to colour the work, meditating upon it and consulting my own simple feelings. I endeavoured to keep myself free from self-delusion as to the effect of the colouring, I said to myself "Here is a little nearer approach to life — it therefore more impressive — yes — yes indeed she seems an ethereal being with her blue eyes fixed upon me!" (Eastlake, pp. 210-11). This statue of the goddess of beauty and love, the Venus Verticordia (= the turner of hearts) was thus very much the major demonstration by the nation's leading neo-classical sculptor of his beliefs: not just that the ancients coloured their sculpture, but also that their art was an idealisation of nature, an abstract of observation in nature. 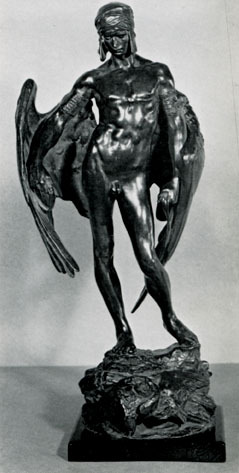 Twenty-two years later, Alfred Gilbert exhibited his Icarus at the Royal Academy. Again this is ostensibly a classical subject that embodies the sculptor's deepest aesthetic outlook and personal involvement. It also was a private commission to adorn its owner's home, it was to be replicated — by the artist — at different scales, it was inspired by the artist's regard for sculpture abroad. But all these apparent coincidences cannot conceal the fact that we are dealing here with sculpture of a different order. Life of John Gibson RA, Sculptor. Ed. Lady Eastlake. London: 1870.